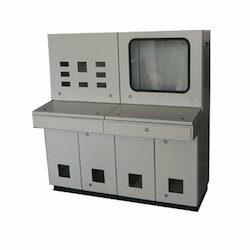 We are a leading Manufacturer of computer enclosure, process controlled computer enclosure and control room computer enclosure from Pune, India. Pioneer in the industry, we are engaged in presenting an impeccable range of Computer Enclosure. Obtainable in various designs, finishes and sizes, the provided enclosure is widely demanded in offices, houses, hotels for sitting purpose. This enclosure is designed and manufactured by our skilled professionals using advanced engineering sciences. Furthermore, the enclosure can be developed applying custom design according to the business needs. Also, the offered enclosure is made available with us at pocket-friendly prices. To meet the diversified requirements of our prestigious clients, we are engaged in offering Computer Enclosure. 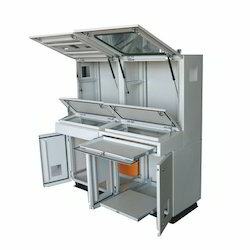 This enclosure is designed and fabricated by our ingenious professionals using outstanding grade steel sheet with the help of avant-garde techniques. Obtainable in various patterns, designs and finishes, the offered enclosure find applications in a variety of construction sites, private parties, open ground exhibitions, industrial setups and resorts. 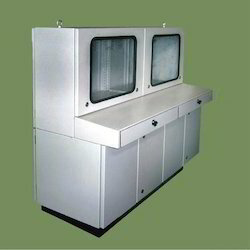 Besides, we offer this enclosure to our valuable patrons at industry leading rates. Standard width 600 mm & 700 mm. Standard height 1300 mm & 1700 mm. 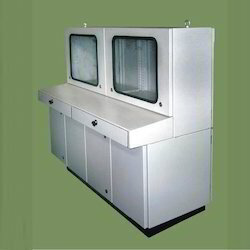 Our organization takes pleasure to introduce its business as one of the leading entity offering Process Controlled Computer Enclosure. In order to design and manufacture this enclosure, our skilled professionals utilize optimum quality steel beams and concrete materials with the aid of contemporary techniques. Additionally, the offered enclosure is tested on different aspects to ensure its robust design. Finally, our customers can install this enclosure at industry leading rates from us. PC controlled Process Automation Enclosure. Bar code printer enclosure with PC enclosure. Monitor tray adjustable in height for better vision. Toughened glass / clear acrylic fitted on monitor door. Gas springs used for monitor door opening and for holding it upwards. Enables hands-free operation. Separate open compartment for CD’s, books and other essential material. Sliding drawer for a keyboard with high-quality telescopic rails with an arrangement for mouse pad below the drawer. Drawer has some additional space for any other material. Lower compartment can accommodate CPU along with stabilizer / UPS. 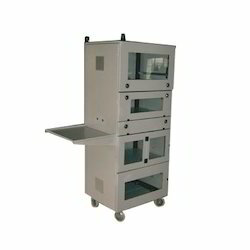 There is space for Printer and stationery in the case of standing operation PC enclosures. CPU tray can be adjusted in height without any tool. Castors or base can be fitted at the bottom. Ventilation through dust proof filters grills. With the excellent support of our brilliant professionals, we are engaged in presenting Control Room Computer Enclosure. 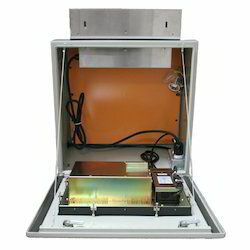 This enclosure is precisely designed and manufactured using fine quality steel and aluminum materials with the aid of sophisticated techniques by our dedicated team of professionals. The provided enclosure is extensively used in apartments, hotels, and other related places. Furthermore, this enclosure is available at a nominal price range. Counted amongst the leading entities of this domain, we are affianced in offering Computer Enclosure. Available in a plethora of patterns, finishes and colours, this enclosure is examined on various parameters. Also, the offered enclosure is designed and manufactured using premium grade steel sheet, iron bars, and aluminium plating under the guidance of our experts in compliance with latest market trends. Besides this, our patrons can avail the offered enclosure at reasonable prices from us. Fostered with vast industry experience and knowledge of this domain, we are engaged in presenting Computer Enclosure. Available in various designs, finishes and patterns, the offered enclosure is widely demanded in commercial centers, corporate offices and luxury houses. This enclosure is designed and manufactured by our skilled professionals using optimum grade concrete materials, steel, aluminum and iron bars with the help of pioneering techniques. Also, the offered enclosure can be installed from us at pocket friendly prices. Looking for Computer Enclosure ?